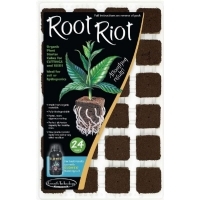 Germination In Rockwool Cubes » Hydroponics Europe Grow Shop - Indoor gardening hydroponic systems and plant growing equipment. Rockwool GRODAN is a natural product. A volcanic rock (basalt) that was originally a liquid of a high temperature up to 1600 °. Through its treatment it is spun up to a volume approximately 90 times higher than its initial size. The rock wool is sterilized at 1600 ° so it is absent from infections and diseases. It has an optimum water retention and a perfect relationship air/water. Extremely easy to use (moist, pH and conductivity in the plate are always under control and easily managed). 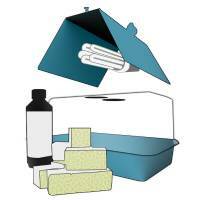 Before using cubes of rock wool it is recommended to leave them to soak for about 24 hours in root booster solution or a buffer solution of pH6 to make the rock wool cubes less alkalised because their natural pH level is 7.0. The following day drip and wring the cubes. 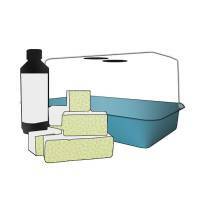 Rock wool cubes retain much water so it is useful draining the cubes to ensure correct replacement of water and oxygen. Put the seed into the hole (of the cube 4x4cm) to a depth of 1/2 cm (half). Cover the cube with a mini propagator or another cover and keep the temperature at around 26 ° with a high humidity of about 80%. 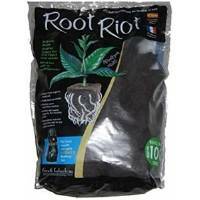 Once the roots begin to grow, they tend to escape from the sides and bottom of the cube. Depending on use, the rock wool cube 4x4cm once sprouted, can also be inserted into rock wool cube 7.5 x 7.5cm which has a hole at the top 4x4cm. Once this first stage is completed the cube can be inserted into any substrate (land or coconut fibre), hydroponic systems, resting on NFT trays without substrate. Initially the seed does not require any light. Once the plants start to emerge it is essential illuminate with delicate light (preferably neon to 1 cm away) or HPS lamp and/or MH (monitoring temp and humidity). Plants that do not receive adequate light tend to have a very long stem. Depending on the type, quality and age of seeds, germination can take from 2 to 14 days. NB: the seed during germination is very sensitive and should not be touched. 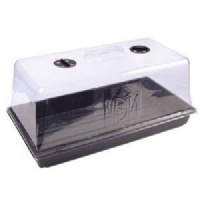 This Propagator will maintain a humid (moist) environment allowing them to feed through their leaves until they can begin to develop roots. 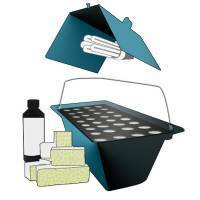 This propagation kit includes the essentials needed to germinate your seeds in to plants ready to transplant in 10-12days, in to pots or in to a hydroponic system ecc.